Open water and surf in February 2018 when Alaska seas are typically ice covered (Photo: C. Irrigoo Jr.). The authors work at the US National Weather Service where Richard Thoman is a Climate Science and Services Manager, Becki Heim is a Marine and Sea Ice Program Manager, and Gene Petrescu is a Regional Scientist. In this article, they describe how Alaska coastal communities are affected by changing sea-ice conditions. This is the first of two parts, providing important context needed to understand how polar environmental forecasts can help mitigate adverse impacts of regional climate change. Until a few years ago, the sea-ice extent on the Pacific side of the Arctic almost seemed to withstand the ongoing warming of the Arctic climate, with even record-high extent observed in 2012 (Fig. 1). 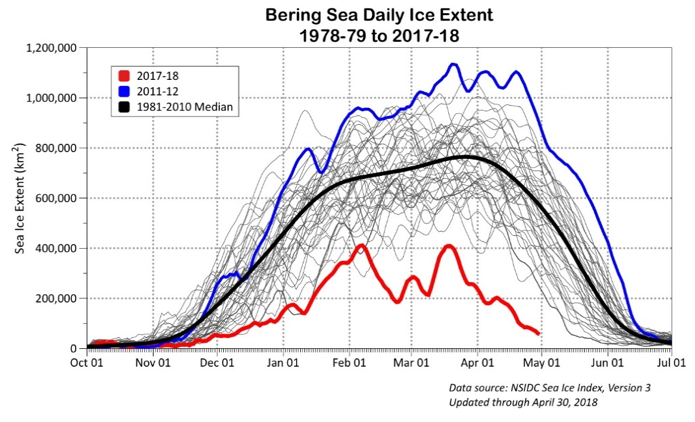 But things look different today: The autumn and winter of 2017-2018 brought record late sea-ice growth to the Beaufort and Chukchi Seas and record low seasonal ice extent in the Bering Sea (Figs. 1, 2). According to the National Snow and Ice Data Center’s Regional Sea Ice Index, sea-ice extent first reached 95 percent of the Beaufort Sea basin on November 13th, 2017, about four weeks later than the pre-2000 median. Sea-ice extent in the Chukchi Sea reached 95 percent of the basin on December 31st, 2017, easily the latest date to make that threshold in the past forty years. In the Bering Sea, daily sea-ice extent has been the lowest in the satellite era record on 52 percent of days since November 1st, 2017. Both oceanic and atmospheric conditions contributed to the very late formation of sea ice, the low extent of sea ice, and generally thin ice. 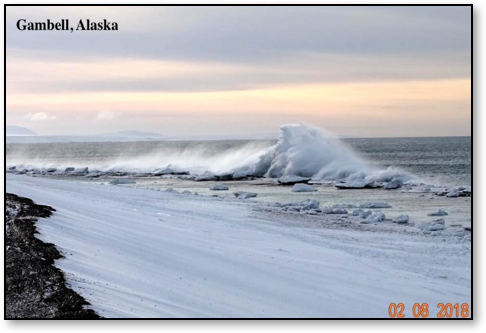 This poor quality ice made travel dangerous if not impossible for subsistence activities, and the ice did not hold up well to strong storm systems frequently breaking apart leaving coastal communities at risk for erosion and flooding from the seas. This continues the trend of overall poor sea ice conditions in 2016 and 2017. Figure 1a: Daily Bering Sea ice extent during the past fourty years (data from the NSIDC Regional Sea Ice Index). 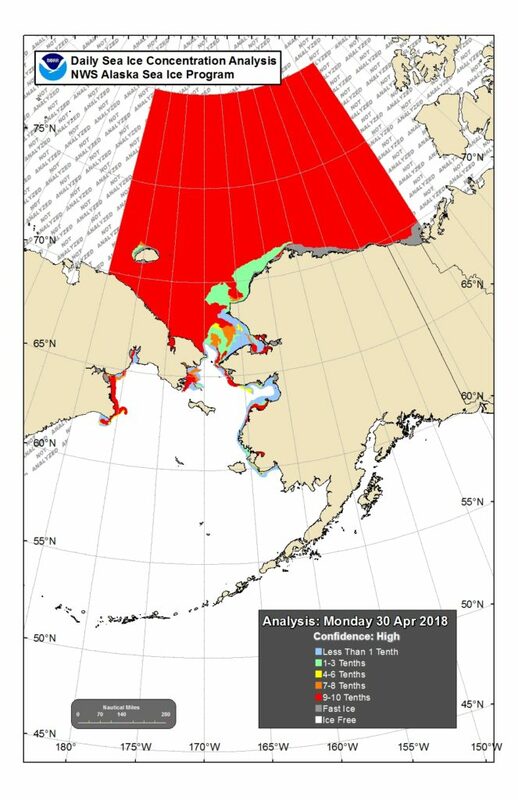 Figure 1b: NWS Alaska Region Sea Ice Program multi-sensor ice concentration analysis for April 30, 2018 (source: NOAA). Impacts at the regional and community levels have varied from inconvenience to serious, with some of the most significant impacts in the Bering Strait region and on St. Lawrence Island. The autumn 2017 storm season was unusually active, and the lack of sea ice contributed to repeated coastal flooding threats from Bristol Bay to the western North Slope. There was significant damage at Shishmaref from a mid-November storm. Several communities are under increasing pressure to make the difficult and costly decisions to remain in place and enhance defenses against the erosion, or to move to a new location. Figure 2: NASA Worldview MODIS visible imagery over Alaska on April 19, 2018. 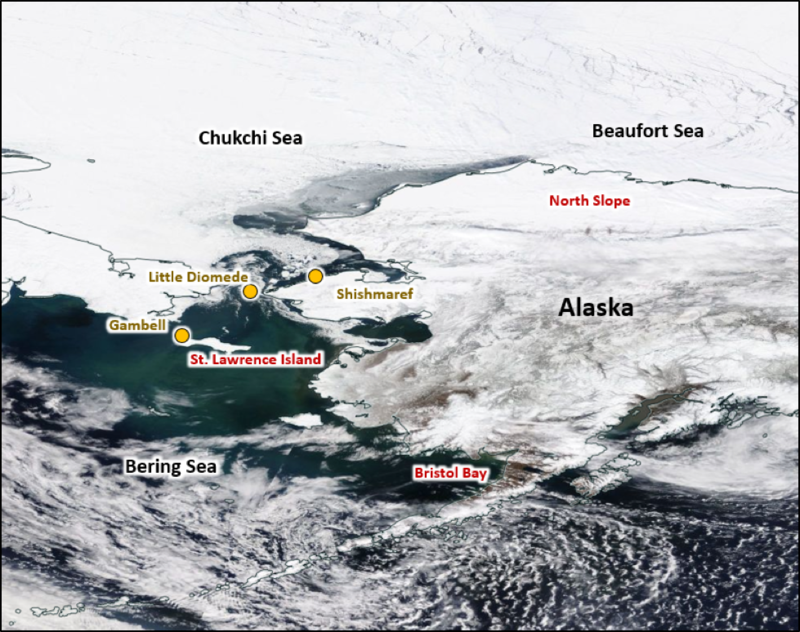 Typically in late April, the Chukchi Sea coast is still nearly 100% ice covered with ice well south of St. Lawrence Island into Bristol Bay. Little sea ice developed in Bristol Bay this winter. (source: NASA). At Little Diomede, unconsolidated sea ice was mobile through the winter, limiting subsistence actives and offering no prospect for construction of a seasonal sea ice runway. The community does not have a runway on land, only a helipad, and has historically relied on construction of a runway on the stable sea ice during the late winter as an alternative to helicopter access. Most Alaska communities in this region rely heavily on subsistence hunting to supplement a significant portion of their food supply. Even where stores are available food is shipped in and is quite expensive. Poor sea-ice conditions in the past two years have led to diminished food stocks, compounded significantly by this year’s conditions, forcing communities to buy additional food at great cost. Ice cover this spring 2018 melted out very quickly with the Bering Sea ice free before the end of May, and the Chukchi Sea mostly ice free in early June (Fig. 3). Spring is the birthing season for seals and walruses, marine mammals which rely on sea ice to haul out on in order to give birth. These marine mammals are also important food sources for Bering and Chukchi sea communities. The very low ice extent this spring had a significant impact on subsistence activities and nutritional community food access. Without sea ice, hunting becomes much more difficult, if not impossible, and dangerous as the hunters traverse open water or in loosely consolidated ice that can change rapidly. They often have to travel longer distances to find ice, leading to increased fuel costs, time lost, and increased danger. Hunters reports from Norton Sound in May indicated travel of over 100 miles (over 160 km) each way to harvest walrus. Hunters also have to adapt to changes in animal population behavior as ice patterns change compared with historical knowledge. The autumn bowhead whaling season at Gambell (Fig. 4) is typically finished by late November as the sea ice progresses southward, but this season whales were not seen until mid-December and the first whale was not harvested until early February. Given the great importance of food security for the communities along the Bering and Chukchi seas, the National Weather Service (NWS) Alaska Region has partnered with the Eskimo Walrus Commission, Arctic Research Consortium of the United States (ARCUS), and the International Arctic Research Center (IARC) at the University of Alaska at Fairbanks (UAF), to produce the Sea Ice for Walrus Outlook (SIWO). The outlook is issued every two weeks from April to June to assist communities to safely hunt marine mammals. The outlook consists of current and forecast information on weather, water, and sea ice. A primary goal of the SIWO project is to provide the data in as concise and low band-width format as possible due to the lack of modern internet communication capabilities in many communities. The outlook can be found at https://www.arcus.org/siwo. Read how the subsistence hunters use the sea-ice forecast information along with their traditional knowledge in Part 2 of this story, to be published in autumn 2018 on Polar Prediction Matters.